Paying LeClaire to Teach you How to Engage Angelic Armies & Conquer Water Spirits? Home › Charisma Magazine › Paying LeClaire to Teach you How to Engage Angelic Armies & Conquer Water Spirits? 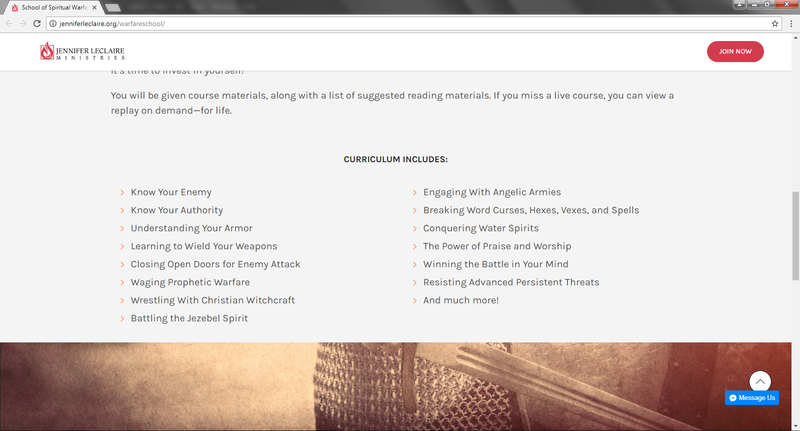 Did you know the Senior Editor of Charisma Magazine, Jennifer LeClaire, runs a supernatural school engaging in spiritual warfare, training people how to engage angelic armies, battle Jezebel spirits and conquer water spirits? This is the same woman who fabricated the sneaky squid doctrine and demonic time-warp nonsense. This is not a joke. And even more disturbing is the fact that Michael Brown, (a NAR Apostle of the New Apostolic Reformation who has attempted to build credibility with conservative and orthodox Christianity), publically endorses Jennifer LeClaire. LIVE CLASSES ARE AT AWAKENING HOUSE OF PRAYER IN DANIA BEACH, FL. OR TAKE ONLINE CLASSES AT YOUR OWN PACE. Source: School of Spiritual Warfare, JenniferLeclaire.org, http://jenniferleclaire.org/warfareschool/, Accessed 06/09/2017.